On October 10, 2002, KC Metro Sports was covering what appeared to be a modest matchup between SM North, 4-1, and Olathe East, 3-2. 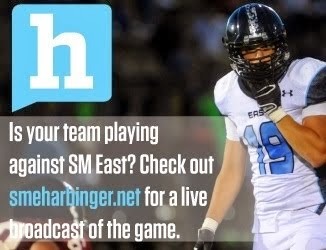 The game ended up being one for the ages with Olathe East winning 23-17. Perhaps the biggest play of the night was that of sophomore Andre Jones. Jones took a toss play to the right, made a cut across the grain, found a seam and ran over 70 yards for a touchdown that put Olathe East up for good in the fourth quarter. The run was Jones’ first major play on varsity scene, but certainly not his last. Jones built on his success as a junior in 2003, churning out over 1,400 yards and 15 touchdowns, leaving defenses dumbfounded on how to stop the athletic specimen. In addition to his offensive numbers, Jones was working on the defensive side of the ball at becoming a shut down corner. His skill set helped Olathe East to the Sectional round of the playoffs where the Hawks were upset by Blue Valley North, 21-16. The lone highlight on the upset night for the Hawks was Jones’ 73 yard touchdown run on their opening possession. Jones was selected as an All-State performer in Class 6A as a junior. Jones came back as a senior with the goal of finally making it to a state championship. Jones was the leader for Olathe East in 2004, helping the team to cap off an 8-1 regular season. On the year Jones rushed for over 1,000 yards, and scored over 25 touchdowns via run, catch, and kickoff return. However, his prowess defensively stood out the most. 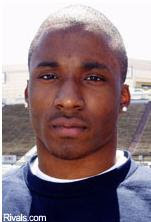 Jones was the Sunflower Conference’s premier corner in 2004, leading the conference with eight interceptions, including a three interception night against SM East in week three. Jones and Olathe East fell short in the playoffs, however, in the Sectional round once again in 2004, losing to SM West 21-0. Following the season Jones was once again voted All-State Class 6A as a defensive back, in addition to being a nominee for the Simone Award, and winning the title as KC Metro Sports Offensive Player of the Year. Following graduation Jones went on to spend a semester at Central Missouri, before transferring to Butler County Community College. i dont either. he was quite the pre-madonna. I like this pick, you guys are right he was a pre-madonna and everything, but the fact is he was an incredible football player. "in the 2005 playoffs, SMW QB Tyler Lawrence broke a great one and was one on one with Andre Jones, who was at DB. When Lawrence got closer, Jones collapsed into a ball in front of Lawrence. The QB attempted to jump over the Andre Jones heap, but failed." This very image graced the cover of the Johnson County Sun the very next morning. The Andre Jones collapse into a ball tackling technique will be remembered in Johnson County for years.